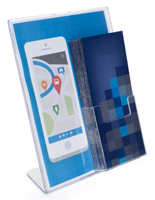 Need to feature promotional leaflets with high visibility pockets? 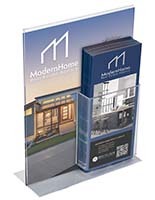 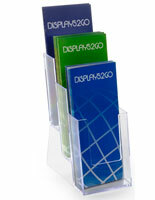 Our plastic pamphlet displays feature clear acrylic pockets that make brochures easy to see from a distance. 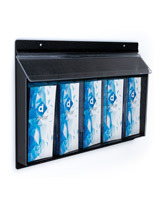 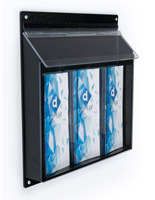 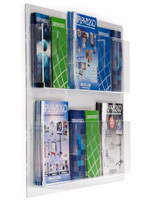 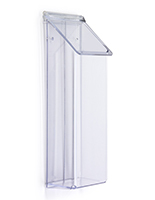 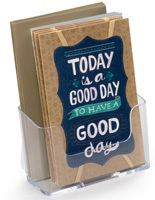 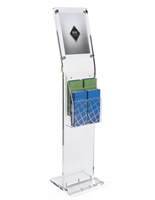 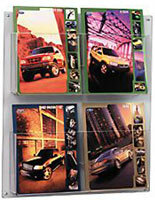 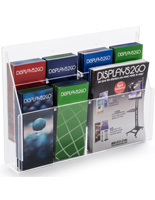 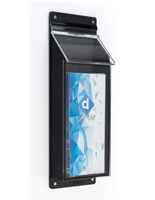 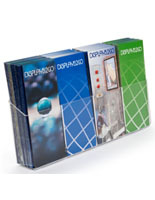 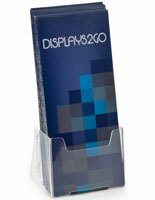 These single and multi-tiered holders are great for dispensing stacks of leaflets. 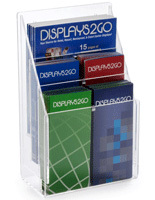 Plastic pamphlet displays are excellent for advertising any organization's print media campaign and spreading their message. 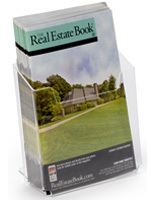 Law offices, banks, real estate agencies, and marketing companies can all benefit from these fixtures. 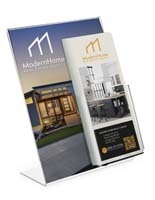 Trifold literature is the ideal way to give passersby more information about your brand using your personalized graphics and messaging. 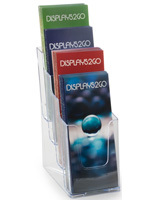 Choose the right plastic pamphlet displays to meet your needs, whether its placed on a reception desk, in a trade show booth, or on an office wall. 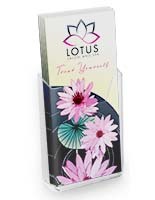 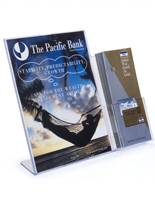 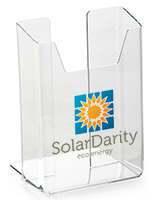 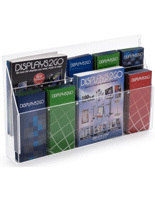 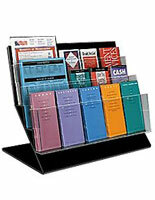 What types of acrylic brochure holders do we offer? 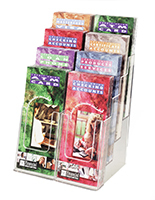 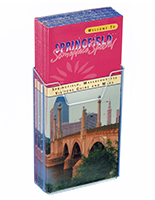 Countertop plastic pamphlet displays are highly compact, making them great for featuring promotional literature anywhere. 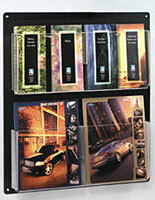 Feature your advertising campaign on the front desk, on your table at a commercial event, or on a coffee shop counter. 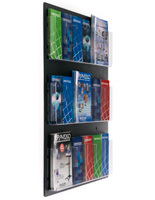 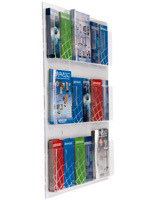 These compact flyer racks have another benefit, they're easy to bring to new locations. 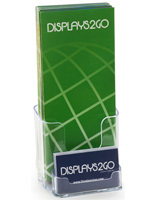 Our knockdown pockets can be disassembled and set up with ease, making them the ideal trade show booth display. 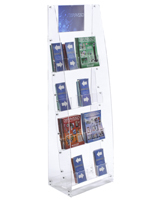 Floor standing pamphlet displays can store large quantities of leaflets in one place. 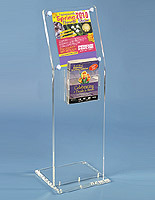 Freestanding racks with acrylic pockets and poster frames are highly effective at getting the attention of passersby. 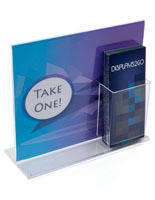 Feature signage ranging from 8.5" x 11" to 22" x 28" to get people to notice your takeaways. 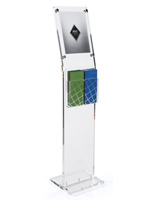 Choose double sided floor stands for promotion in malls and department stores where your audience will see it from both sides. 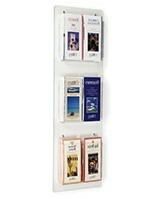 Wall mounted pamphlet displays will fit where others can't. 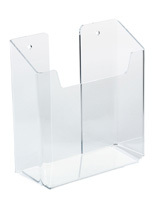 Choose multi-tiered flier holders to hold large quantities of takeaways without using any floor or counter space. 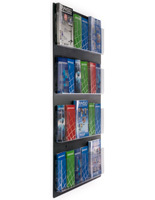 Wall mounts are ideal for placement in banks, doctor's offices, and waiting rooms where visitors can look for the services that interest them. 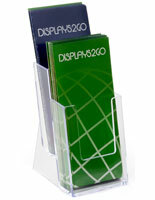 Are there brochure displays with special features to boost my promotional campaign? 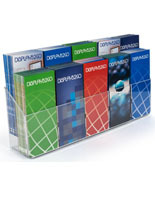 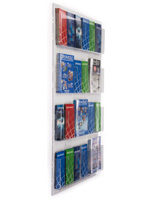 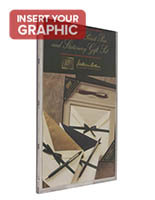 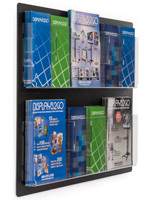 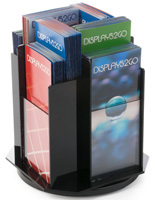 Custom printed leaflet racks feature company branding to increase your organization's presence and recognizability. 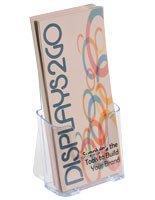 Feature your messaging in full color right beside important information for customers. 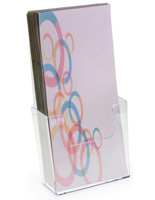 Fixtures with adjustable pockets, on the other hand, are capable of holding magazine sized booklets as well. 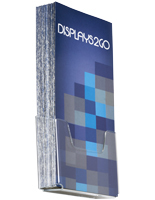 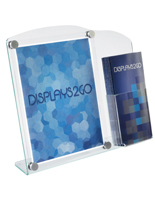 Simply remove the acrylic divider to feature multiple sizes of promotions. 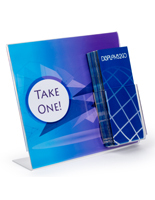 Get passersby to learn more about you with takeaway literature, no matter the format!